Is planning your trip to Hobart stressing you out? Book a holiday package deal with Webjet! Gone are the days of trawling the internet and slowing down your computer with a million tabs open. Webjet hunts down the best flight and hotel combos to make sure you get great value for your money. All you need to do is choose the option that suits your budget, enter your travel dates and get to the airport on time. It's the perfect solution for travelling families, friends or groups. You'll scoop up discounts; save time and won't have to worry about accidentally booking a hotel that doesn't match your expectations. Start searching the latest Hobart holiday package deals with Webjet's powerful search engine. Hobart International Airport (HBA) is the main passenger hub in Tasmania. It operates flights to five destinations in Australia and is the ninth busiest airport in the country. There are 12 direct flights every day from Melbourne Airport (MEL) to Hobart with Jetstar, Virgin Australia and Qantas. There are also daily direct flights from Sydney Airport (SYD) with the same airlines. The total flight time from both cities is approximately 1 hour 10 minutes, making Hobart an easy weekend getaway for Victorians and New South Welshmen. Other major cities with direct flights to Hobart include Brisbane, Adelaide, and Perth. Hobart holiday packages offer a variety of accommodation options. Whether you're looking to unwind at a hotel near the beach or book out an entire apartment for your family, there's something to suit your budget and needs. Choose from three to four-star hotels in the heart of Hobart's city centre. You won't have to walk or drive far to see the top attractions, or find a delicious restaurant. Depending on where you book, you can find yourself in a hotel with an on-site gym, buffet breakfasts and a round-trip airport shuttle. Travelling on a budget? Book a Hobart package deal to one of the city's top hostels. It's a great way to meet people from around the world while keeping your costs down. You'll have a communal kitchen to make your own food, comfortable bunk beds with power points, and access to other amenities such as luggage storage. If you're travelling with your family or a large group of friends, it's easier and cheaper to rent out an entire apartment than individual hotel rooms. You'll have access to a fully-equipped kitchen, and everyone will stay under the same roof. It's the perfect option for people who prefer a cosy, home environment and want to get a taste for what life is like as a local. 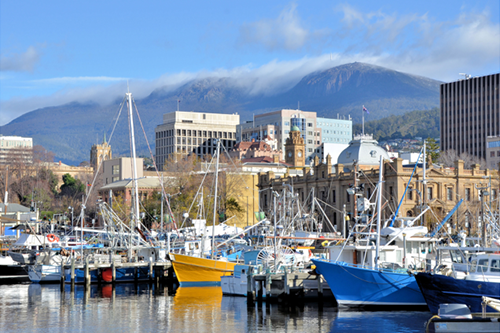 Hobart is the capital city of Tasmania and is Australia's southernmost city. Located on the edge of the Derwent River, Hobart is full to the brim of cultural experiences. It's the perfect city getaway for Australians that want to explore the vibrant art scene, experience a slower pace of life and sample some of Tasmania's top culinary delights. Rising above Hobart at 1,270 meters, Mount Wellington is the city's iconic natural landmark. Pack a good pair of walking shoes and follow the trail up to its summit. You'll be rewarded with 360-degree views of the city below and the coastline. If you're short on time or not able to hike up the mountain, it's possible to drive or take a shuttle bus to the top. The Salamanca Market is held every Saturday from 8:30am until 2pm. It's home to more than 300 open-air stalls, and you can buy everything from fresh produce, artisan products, crafts and delicious ready-to-eat food. Get here early if you want to beat the crowds and make sure you stick around for the live music performances.